The Housing Supply Coordination Taskforce for Dublin was set up in 2014 to identify housing developments that have planning permission and that are capable of delivering housing to the market. This remit includes monitoring relevant housing data on the supply of viable and market-ready approved developments. Data collated by the Dublin Housing Supply Coordination Task Force on the aggregated planning permissions and planning applications across the four Dublin local authorities is published every quarter. The Most recent figures date from Q3 2017. This data is useful for accessing whether housing supply is capable of meeting demand. The data also has a secondary use in that it can inform planning for services, both social and commercial. For example, a business making a location based decision can use this data to identify concentrations of new housing developments. 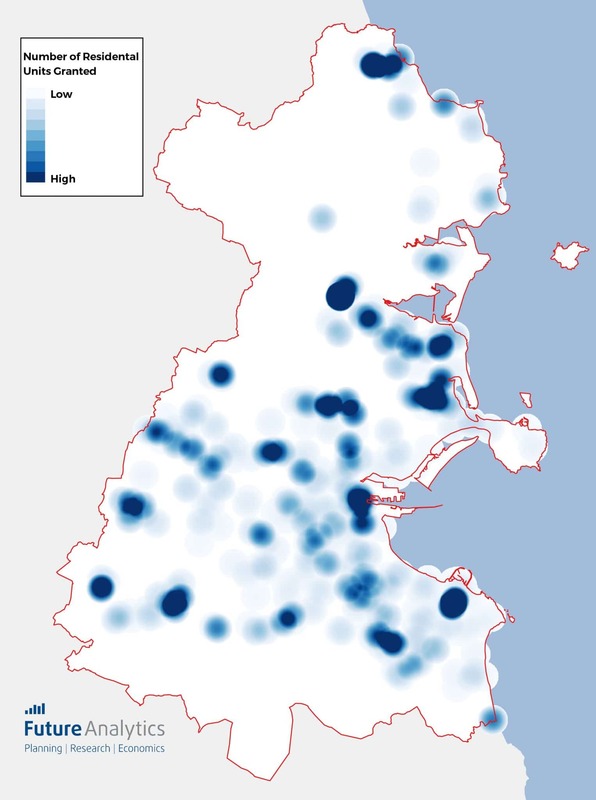 By creating a heat map using the data supplied by the Dublin Housing Supply Coordination Task Force we can see the highest concentrations of pipeline housing developments are to be found in peripheral areas of the city and in coastal areas of North County Dublin. Major infill developments can be seen in Dublin’s Docklands, at the former site of Dun Laoghaire Golf Club and at the former site of the Phoenix Park Race Course. The comparative lack of new developments in the older suburbs of the city is also apparent. This is in part due to the fact that the data only includes developments of 10 or more units. Future Analytics Consulting’s own figures show that over 250 developments with less than 10 units have been granted planning permission by Dublin City Council. The taskforce’s data also excludes student accommodation. While this accommodation isn’t available to home buyers a study carried out by Future Analytics Consulting reveals that developments accounting for several thousand student bed spaces have been granted planning in the city. The availability of purpose built student accommodation should free up some existing stock for other sectors of the population. The taskforce’s figures only include new builds, as a result existing building stock which has been renovated, extended or repurposed is not included. For example, the a recently completed 49 unit co-living development close to Future Analytics Consulting’s offices at Fitzwilliam Square is not included in the taskforce’s figures. By grouping planning permissions by postcode, we are able to build up a clearer picture of distribution of the pipeline housing developments. The postcode with the highest number of units granted planning permission is the northern suburban area K67 (Swords) in Fingal while Dublin 10 in the Dublin City Council area has no private developments of 10 or more units in the pipeline. Permission to build does not always lead to the delivery of housing, usefully the taskforce’s data also includes figures for the number of units commenced in each development. The map below shows the number of units commenced in each postcode. The figures show that a high proportion of houses and apartments granted planning permission in Dublin 3, Dublin 5 and A96 (Dun Laoghaire) have commenced construction. The proportion is very low in Dublin 17, Dublin 1, Dublin 12, K34 (Balbriggan) and A94 (Blackrock). Across the whole county only 40% of units with active planning permission have commenced construction. The number of units granted permission but not commenced in each postcode is shown in parenthesis in the map below.